Here at Killgore Adventures, we spend a lot of time out on the water. Between running jet boat tours up and down Hells Canyon, and leading fishing trips, we’ve learned a lot about the fish that live in the canyon. Throughout the fishing season, there are parts of the year where some fish flourish while others hide away. To make sure you get the most out of your next riverboat fishing adventure, we thought we’d take some time to introduce some of the most common fish in Hells Canyon. Salmon are some of the most sought-after fish in the world. Their brilliant pink and flavorful meat make them a prized catch to share with friends and family. We’ve found that the best time of year to go after salmon is between May and June. During this period, the salmon are healthy and heavy, with most clocking in somewhere around the 12 to 15-pound mark. That said, it’s not uncommon to catch salmon in Hells Canyon that weigh more than 20 pounds! The rivers running through Idaho are often flush with salmon, as the Idaho Department of Fish and Game estimates that an average of 134,000 fish rush through every year during the spring, summer, and fall runs. Their plentiful numbers make them easy to catch if you have the right gear. You’ll need a heavier weight rod and a reel with a good drag. Salmon don’t give up without a fight, so make sure to bring a durable fishing line to wrestle both the fish and the current. Our team of fishing guides can help you find the right materials and how to set up your rod to ensure you can catch the biggest salmon! Fully grown steelhead begin to populate Idaho’s waters in the late summer, and through the early spring, essentially from September to March. They spend their winters in the waters of the Snake and Salmon rivers, preparing for their trek upstream to their tributaries in the spring. Typically, steelhead vary in size from 23 to 26 inches and weigh about 5 pounds. On occasion, anglers have caught their larger cousins, that jump in size to up to 34 inches in length, and a whopping 13 pounds! Steelhead as large as 20 pounds have even been caught on one of our riverboat fishing trips! Again, you’ll need tough gear to bring in these fish, as the current can batter your rod and reel as much as the fish itself. Smallmouth bass and rainbow trout occupy the rivers of Idaho and Hells Canyon nearly year round. Their peak season is from April to October, meaning you can catch these fish all day long on your next riverboat fishing trip. Generally, you’ll find rainbow trout ranging in size from 12 to 30 inches, and weighing from one to five pounds. The average smallmouth bass weighs about two to three pounds, meaning they are the on the smaller end of the big fish you’re likely to catch with any frequency in Hells Canyon. Both of these fish have short lifespans, meaning they spawn in large numbers. You’ll never run short of trout and bass to catch when you head out on the Salmon and Snake Rivers! These ancient leviathans are perhaps the most famous of all the fish in Hells Canyon. North America’s largest freshwater fish, sturgeon can often be found larger than 10 feet in length, and weigh more than 300 pounds. Some have even been reported to live as long as 100 years! While sturgeon are strictly a catch-and-release fish, that doesn’t mean you can’t experience the thrill of bringing in one of these monsters during their peak season of April through October. If you catch a sturgeon, we’ll take the time to get you down into the water to snag some photos with your prize catch. You’ll need specialized gear to land a sturgeon. Make sure you use barbless hooks and sliding sinkers, in addition to a seven-foot, heavy reel, and at least 50-pound monofilament. If you’re serious about catching a sturgeon, make sure to talk to Captain Kurt Killgore and his crew for the best advice. 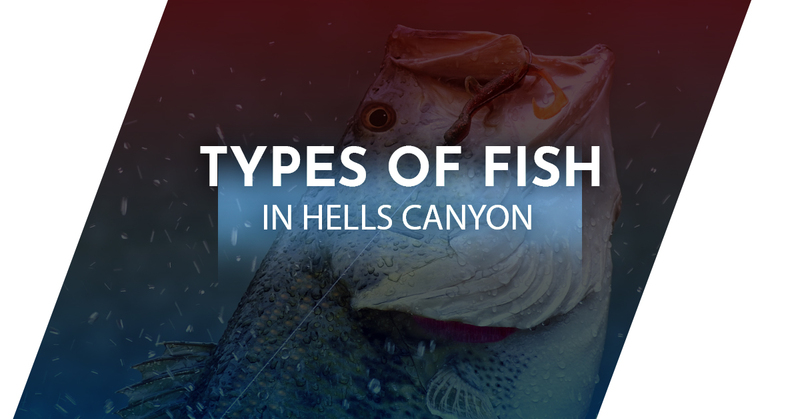 While these are the most commonly caught game fish, that doesn’t mean they’re the only residents of Hells Canyon. The canyon is full of fish like bluegill, crappies, and even catfish! Truly, Hells Canyon is an anglers paradise, with well-stocked rivers and unrivaled scenery. The Idaho Department of Fish and Game has compiled a list of the fish commonly caught in the area and the list is extensive! Ready to start catching fish like never before? Then it’s time to sign up for a riverboat fishing expedition with Killgore Adventures! We run trips during the peak seasons so you can catch the largest and most impressive specimens! Book your trip today! Killgore Adventures is an Equal Opportunity Recreation Service Provider and Employer Operating Under a Special Use Permit from the Hells Canyon National Recreation Area, Wallowa-Whitman National Forest. © 2017 Killgore Adventures. Do Not Copy.